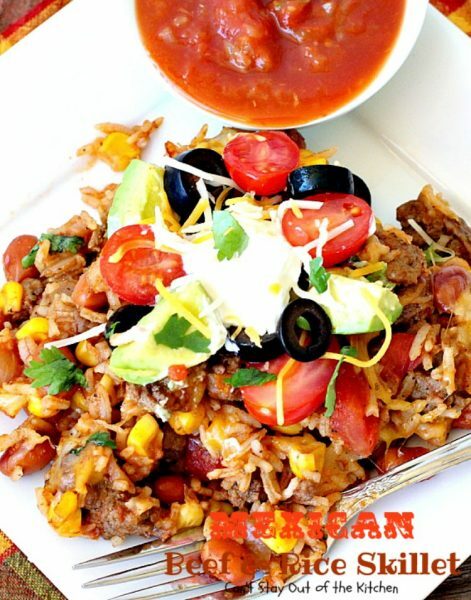 Words cannot adequately express how amazing this Mexican Beef and Rice Skillet entree is. 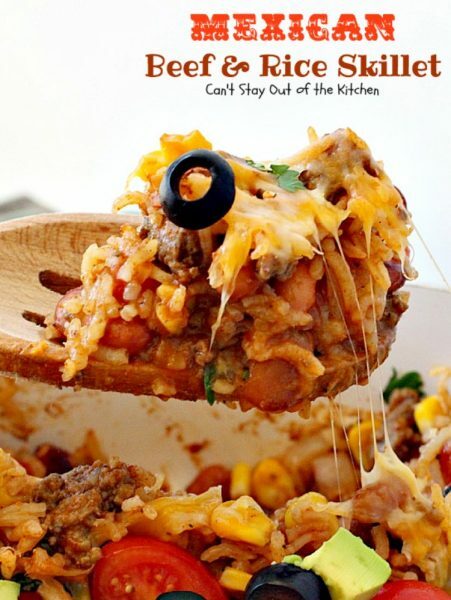 This one-skillet supper dish is one of the best recipes I’ve come across in some time. It’s flavorful, filled with delicious veggies, and is not overly difficult to make. This recipe uses ground beef, basmati rice (or your favorite kind of rice), pinto beans, corn, diced tomatoes and Homemade Taco Seasoning. Once all that cooks down it’s drenched in cheese and topped with your favorite toppings. I used sour cream, additional cheese, grape tomato halves, sliced olives, cilantro and avocado. 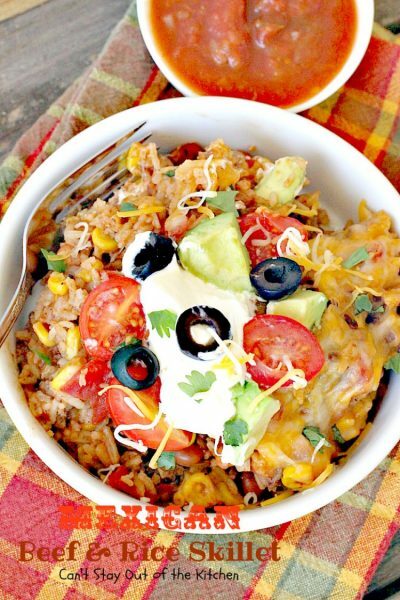 You can also use either salsa, homemade guacamole, or pico de gallo–whatever you prefer. S-P-E-C-T-A-C-U-L-A-R doesn’t begin to describe how something with so little time and effort can turn out so delicious. 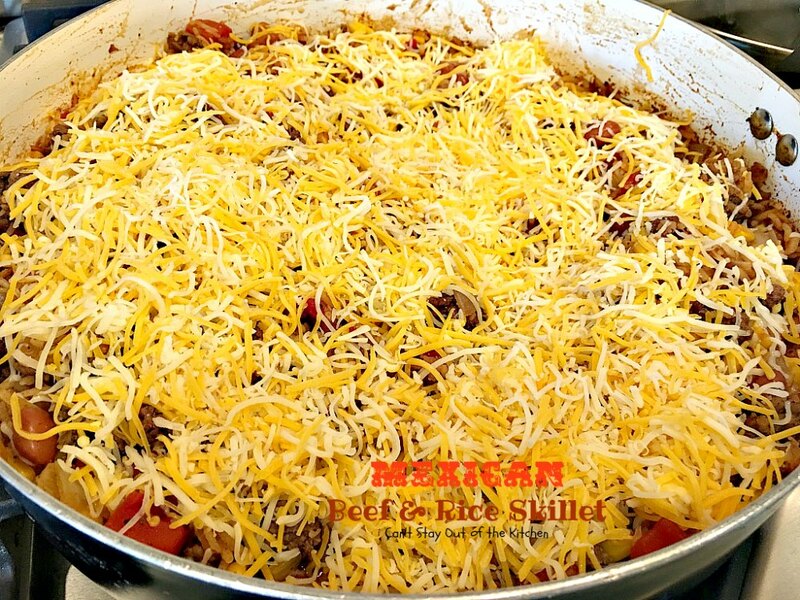 This recipe is gluten free and clean eating if you substitute Homemade Taco Seasoning for the regular taco seasoning packets in the recipe. 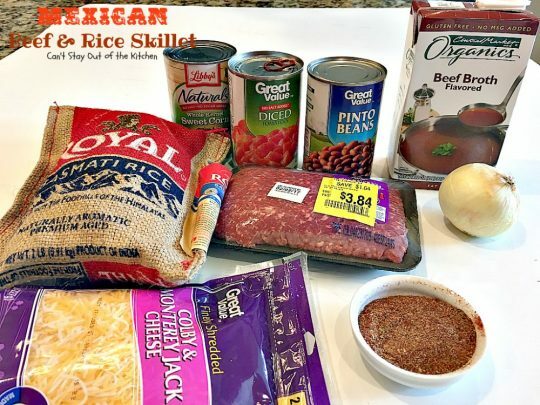 I always substitute my recipe for Taco Seasoning these days since seasoning packets have a lot of preservatives, MSG, fillers and other ingredients that cause health problems. If you have all the ingredients on hand, you’re own homemade version doesn’t take more than about 2 minutes to make. So it’s easy and healthy. I was so delighted to find this recipe a couple of months ago. I had pinned it on Pinterest and found it again when I was looking for something new to try. I have to tell you, I’m not big on one-dish meals. While I’ve always loved casseroles, I haven’t made a lot of one-dish skillet meals over the years (except Hamburger Helper when we were first married and poor). That’s about to change, because this recipe has me convinced! We loved it. Even the leftovers were delicious (and that was with microwaving the sour cream and other toppings when I reheated it!) 🙂 Seriously, Mexican Beef and Rice Skillet has got to be put on your menu selection soon. I find myself craving this entree weekly! If you’re looking for a marvelous recipe to serve your family for dinner this week (or next), give this one-dish Mexican Beef and Rice Skillet a try. You won’t be disappointed and your kids will love it. 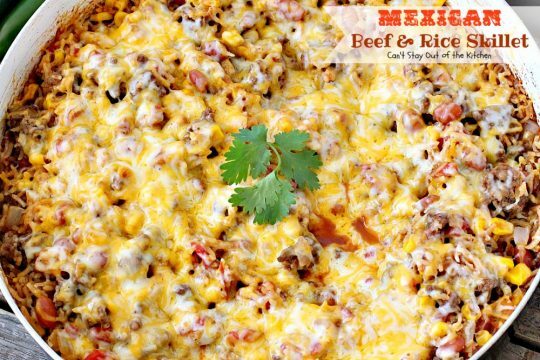 This recipe is only very mildly spicy, so it’s a good way to begin if you’re not used to eating Tex-Mex on a regular basis. I hope you don’t pass up this recipe because it’s really terrific. Mexican Beef and Rice Skillet has become one of our favorite one-dish meals. 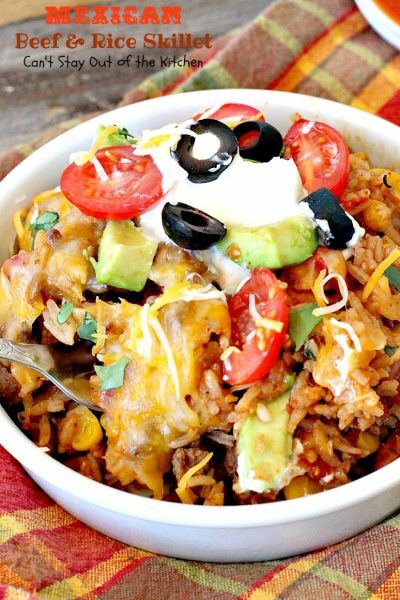 This dish is so flavorful. We loved the taste of everything mixed together. Prepare yourself for one delicious meal. 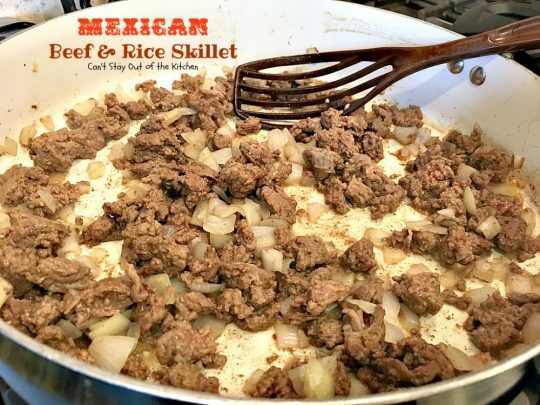 I can’t recommend Mexican Beef and Rice Skillet highly enough. It’s amazing. I used these ingredients. The small bowl contains Homemade Taco Seasoning. It only takes about 2 minutes to whip up if you have the ingredients on hand. (You can also use a taco seasoning packet). Cook the onion and beef in a large skillet until beef is no longer pink. Drain any fat. I used a 96% lean beef so there was no fat to drain. 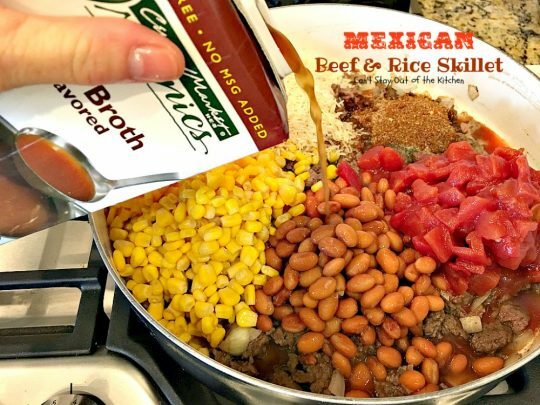 Add diced tomatoes, corn, pinto beans, Homemade Taco Seasoning, rice and beef broth. Stir ingredients to combine. Cover with lid. Bring to a boil, reduce heat and simmer about 20 minutes. Sprinkle shredded Monterey Jack and Colby cheeses over top. Cover with lid again and cook over low heat about 3-5 minutes or until cheese melts. 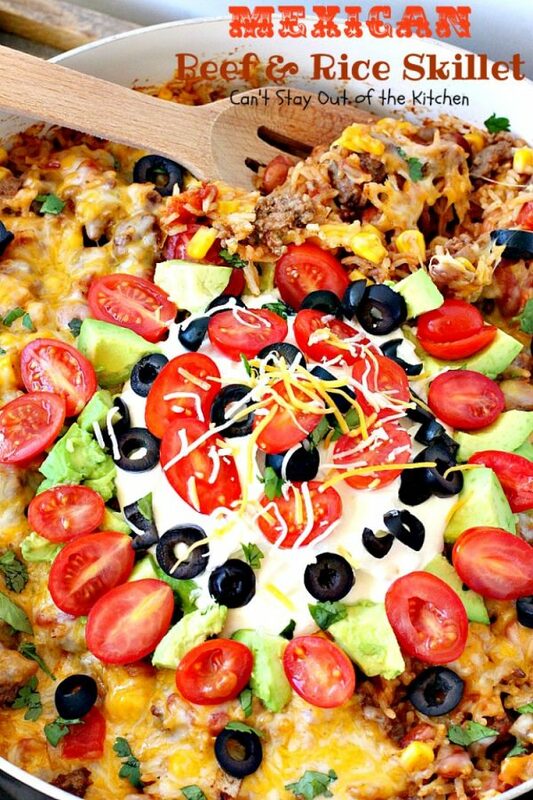 To serve: garnish with sour cream, avocados, grape tomatoes, olives, fresh cilantro and extra cheese. 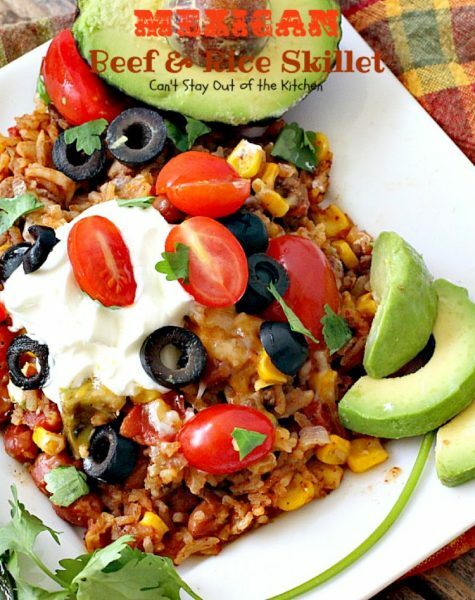 Serve with salsa, guacamole or pico de gallo, if desired. 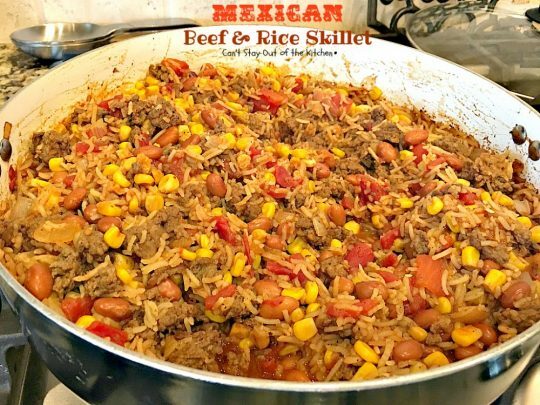 Every scoop of Mexican Beef and Rice Skillet will have you drooling! 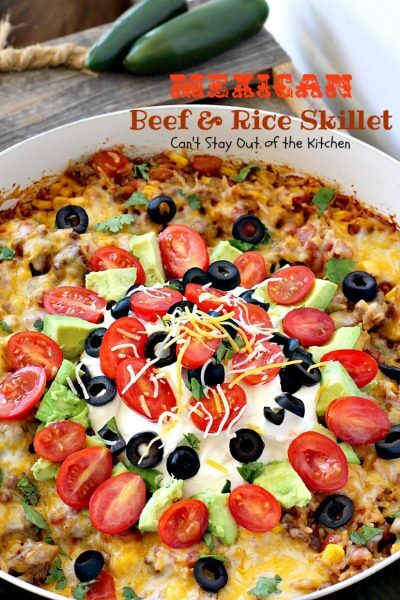 Even your kids will enjoy Mexican Beef and Rice Skillet. It’s not overly spicy and the flavors are superb. The cheese and toppings take this Tex-Mex beef entree to the next level. This amazing Tex-Mex entree is a one-dish skillet meal with ground beef, tomatoes, corn, pinto beans and cheese. It's topped with sour cream, tomatoes, olives, cilantro and avocados. 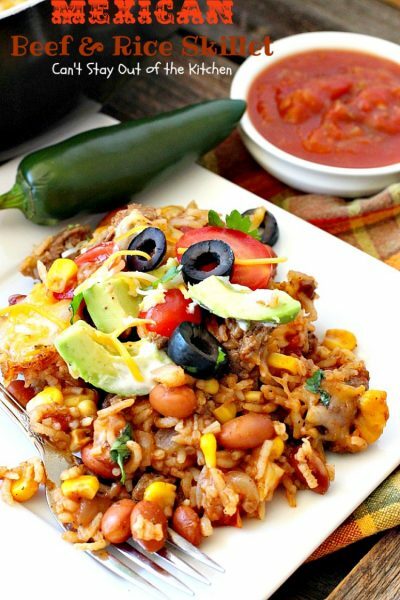 Serve with guacamole, salsa or pico de gallo. Gluten free. Cook the onion and beef in a large skillet over medium heat until beef is no longer pink. Drain any fat (but there won’t be much if you use 96% lean beef). 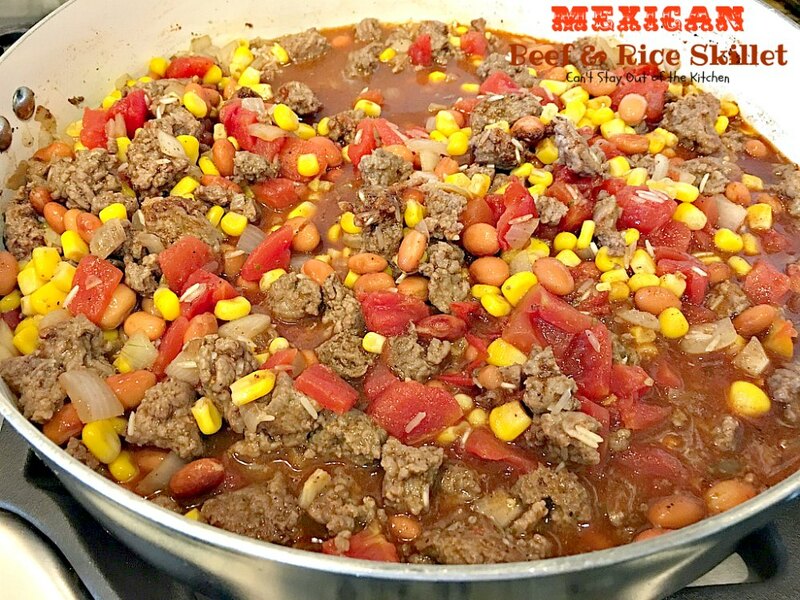 Add taco seasoning, diced tomatoes, corn, beans, rice and beef broth. Bring mixture to a boil, then reduce heat and simmer, covered, for 20 minutes, stirring occasionally. 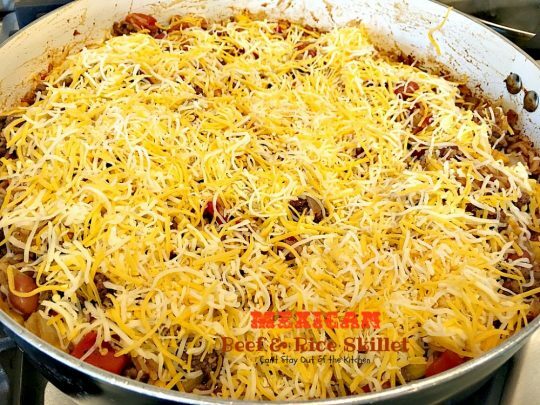 Sprinkle 1 1/2 cups shredded cheese over top. Cover with lid and cook over low heat for about 3-5 minutes, or until cheese is melted. 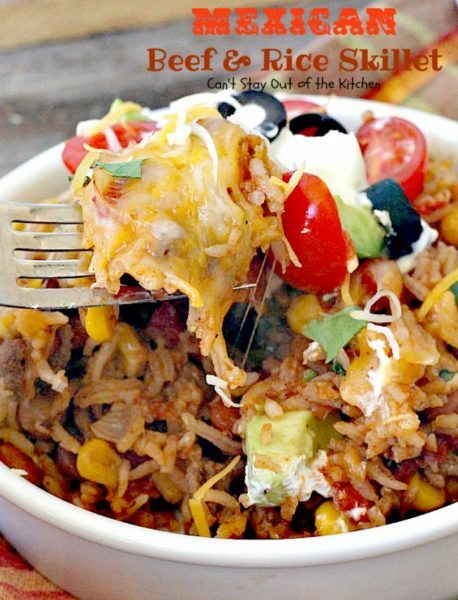 Remove from heat and serve with Taco Toppings. Chop or slice up veggies as desired. Set aside. Place 1 1/2 cups cheese on top of skillet and cook, covered with lid, as directed above (about 3 minutes). Dollop sour cream over top of melted cheese. 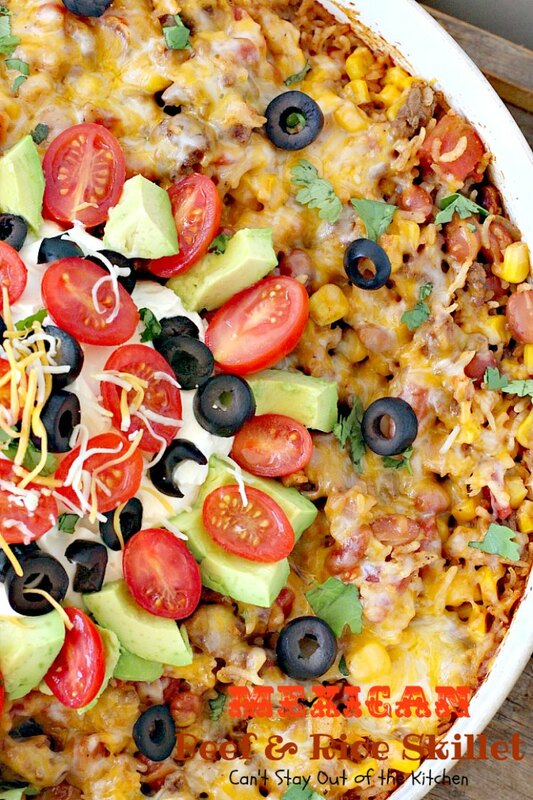 Sprinkle with freshly chopped cilantro, tomatoes, olives, avocados and cheese, as desired. 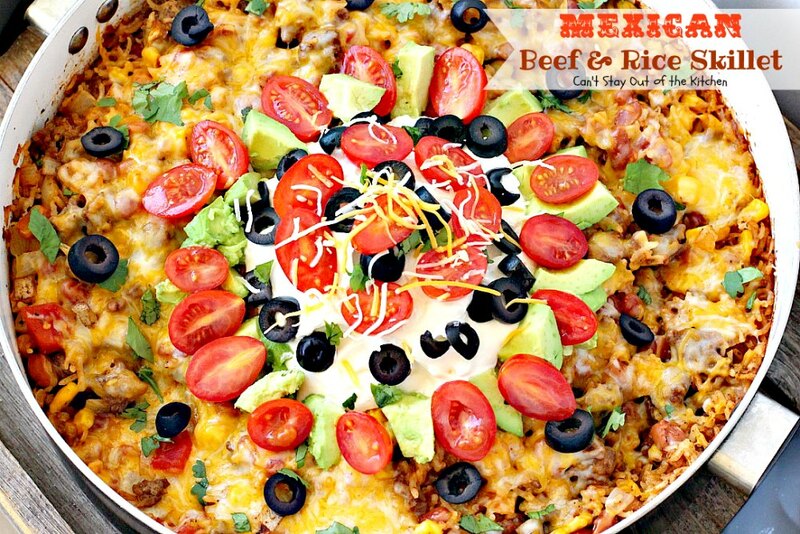 Serve with pico de gallo, guacamole or salsa, as desired. Recipe adapted from I Wash You Dry. We loved the taste of this Mexican Beef and Rice Skillet supper entree. If you’re looking for a terrific meal to share with friends, this is it! Cilantro, avocados, tomatoes, olives, sour cream, cheese, salsa, guacamole and pico de gallo make this dish really scrumptious. Items You May Find Helping in Making This Recipe.